A couple of weeks ago, Lidl contacted me to tell me they were publishing a small recipe booklet by Paul Flynn to be distributed for free in-store. They asked me would I be interested in getting an advance look at the booklet and trying out the recipes for myself. Given that the theme of the recipe booklet was “7 family meals for €50”, I thought it would be right up my street and took a look at what Paul had come up with. As is my way, I gave Lidl a ridiculous amount considerable feedback. With my permission, they have published some of it today in the Irish Farmer’s Journal. However, what they didn’t include was the recipes that I was able to come up with. Even though Paul gives a comprehensive shopping list, all of the ingredients are not used in his recipes. Which left me with leftovers. Enough in fact to make 4 more dishes (including a dessert) by adding just €2 to the shopping list. Today I’m sharing the first of these recipes, which can be made without adding anything to the shopping list at all. I’ll add a further 3 recipes to the blog over the next week or so but just in case you are going to shop/cook by this recipe booklet you should consider including a roll of chilled puff pastry and some extra potatoes to your shopping trolley. It’s worth it I promise! Today it’s a main meal that doesn’t require any extra purchases. You should also bear in mind that I believe that the meatballs dish is worth 2 family meals and not the 1 as stated in the booklet. By my calculations that gives you 9 meals for 4 people for €50 which is an average portion cost of just under €1.60 per person, which allows for store cupboard ingredients and the cost of energy (gas or electricity) when cooking. While our average portion costs would normally be lower, it still represents good value if you are living on a tight food budget. I would be concerned about how much meat and dairy protein is included in the meals. A little less would save money, however Lidl is one of the few supermarkets in Ireland that doesn’t stock a wide range of beans and pulses for the store cupboard. 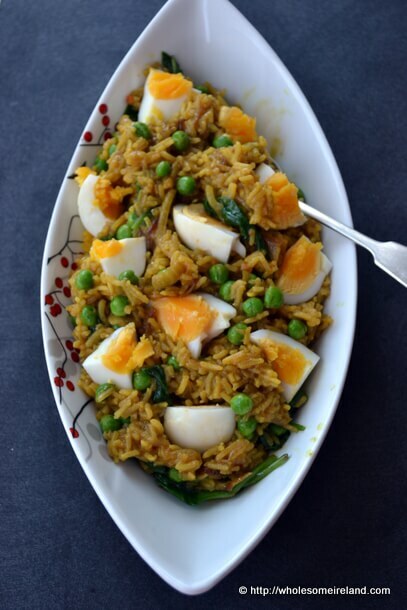 This kedgeree is the family’s favourite out of all the dishes we made from the leftovers. The mild curry powder adds a sweet note to the meal. This is a one pot wonder, with very little washing up and plenty of smiling faces. You will not need to buy any extra ingredients from the recipe booklet to make this meal as you can cobble it together from the leftovers. Softboil 2 large eggs by placing them in a pot of cold water and bringing the pot to the boil. Once the water is boiling, remove from the heat after 3 minutes. Plunge the eggs into cold water and leave to 1 side. Take a large saucepan/frying pan on a medium heat and melt the butter in the olive oil. Add the onions and gently fry. Turn them every now and again with a wooden spoon. You want them to caramelise so this will take about 15-20 minutes. Once the onions have turned golden brown, add the curry powder and toss in the oil then pour the rice into the dry pan. Toast the rice for 3 minutes, then pour in the hot chicken stock and stir until simmering, turn to a low heat. Do not cover the pan. Allow the pot to simmer for the next 20 minutes or so. Stir every now and again to make sure it’s not sticking to the bottom of the saucepan. After 20 minutes most of the liquid should be soaked up into the rice. Pour in the frozen peas, followed by the spinach and stir well until both are cooked. Peel the boiled eggs and cut into quarters. Serve the kedgeree immediately with the sliced eggs on top. Season to taste. Please note: This blogpost has not been requested or sponsored. I am happy to freely share that you will get more than the stated 7 meals from this recipe booklet. In hard times, the sharing of knowledge and information is a privilege. Whether or not you choose to shop in Lidl or any other store, this meal is frugal, filling and tasty. It’s going to be interesting to compare this to the new cookbook from Jamie Oliver “Save With Jamie”. A review copy arrived yesterday and I’m giving it plenty of scrutiny. Keep an eye out next week for that review! Ohh sounds great, I usually shop in Aldi but will pop in to lidl for this leaflet. Have you watched save with Jamie on TV? It is two episodes in and i am enjoying it, although his 15 minute meals book I found to be a disaster so will not be running out to buy this one! Yes indeed Lisa I’ve been watching it. I received a copy of the book yesterday to review and I’ll be detailing it next week. It is very interesting. Lovely food all the same on the TV show anyway. This is one of my favourite comfort foods, looks delicious! Thanks Minnie, it is a real comfort food alright!